(VOV) - The Lunar New Year (Tết) holiday can be a reality check for longer term foreign residents in Vietnam like me. No one enjoys donning the tourist label indefinitely. Make an effort at learning the language, adapt to the pace and rhythms of a city, become a recognisable face to some of your favourite vendors and at some of your favourite haunts…it starts becoming possible to convince yourself you’re different. The mania of pre-Tết preparations encourages this. Everyone is too busy with their own obligations and commitments to pay much attention to the visitors in their midst. 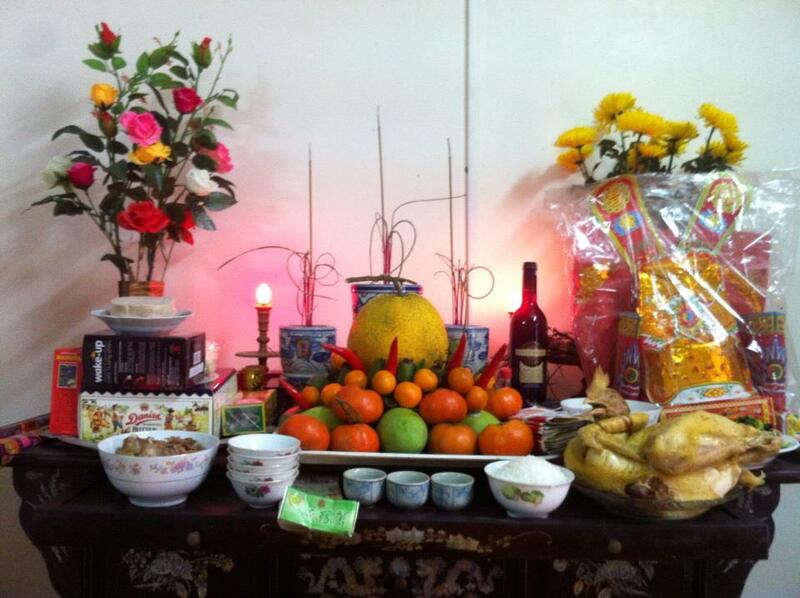 But then the morning of Ngày Tất Niên—the 30th day of the 12th lunar month—arrives. The plunge from the preceding week’s frenetic energy is startling. Many if not most shopfronts are shuttered, and the masses once clogging every street corner and alleyway are replaced by the trickle of last minute purchasers amongst a steady stream of kumquat trees and peach blossom branches being ferried to their reserved prides of place in households across Hanoi. Distinctions between “outsiders” are immediately erased—you’re all spectators. There’s nothing like watching a nation’s most important cultural and social event unfolding around and apart from you to deflate any pretensions you feel you might’ve earned. Which only made me even more appreciative when a friend asked if I would join his family in marking the last night of the year. The Vietnamese lessons before my university break for the holiday had covered the significance of Đêm Giao Thừa, the crossover from the old lunar year to the new. There was some trepidation. I desperately wanted to avoid marring 2013’s beginnings through ignorance or awkward breaches of etiquette. Carrying gifts I’d chosen following the carefully considered advice of my teacher, and the red envelopes of lucky money I was sure I’d need later, I joined the traffic en route to their own special gatherings and reunions. Anticipation hummed. I arrived as my friend’s wife and his daughters were moving the bữa cơm tất niên (year-end party) downstairs from where it once sat at the centre of the house’s altar. 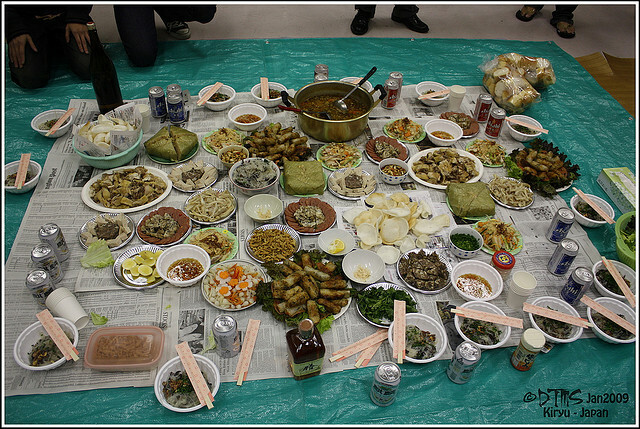 The various elements comprising 2012’s final meal had already been offered to the gods and family ancestors. A beautifully framed calligraphy scroll hung from the wall of the room where I was welcomed. An ode to patience, written in classical Chinese, by a master whose skills were always in demand but particularly during Tết. We admired it while I tried my best to stay out of the way. The clatter of chopsticks signalled everything was ready. A feast. Spring rolls, both pork and seafood, green papaya salad with dried beef, sliced smoked pork, the absolutely essential bánh chưng (square cake made from sticky rice, green beans and prok), fried dumplings crusted in young rice flakes with taro and whole egg fillings, poached chicken, canh măng (braised bamboo shoots), heaped bowls of greens, an assortment of tailored dipping sauces and matching herbs. The centrepiece was canh bóng bì lợn, a soup I hadn’t tasted before, made from dehydrated fried pork skin soaked in a broth sweetened by dried mushrooms, prawns, and fresh vegetables. I didn’t know where to begin. The plenty was more than a little overwhelming. Under repeated urgings of cứ tự nhiên như ở nhà (loosely make yourself at home) I indulged in my friend’s family’s generosity. There was no stopping his mother’s expert selections of the best of the bounty from ending up in my bowl. The eating never really ended. It just gradually slowed down. While we waited for midnight’s approach, the family enjoyed parts of VTV’s comedy broadcast. The humour appeared cathartic. My friend mentioned his business hadn’t escaped the repercussions of the trying economic year. Joking about such difficulties both acknowledged and swept them aside, clearing their taint from the first moments of 2013. I watched as my friend’s wife and mother arranged the night’s second tray of offerings. There was a solemnity to the preparations that humbled my normally cynical self. Traditional items—chicken, fruit, rice, salt, water, alcohol, flowers—were crossed off a mental checklist with evident care. His mother noted her household altar’s offerings would be burned at a later date, the third day of Tết calculated as the most propitious. Sticks of incense were ignited and we departed the house, leaving the Year of the Dragon behind. The street outside was the busiest it had been all day. Cars and motorcycles secured prime viewing positions. Children were shouting across the throng, recognising friends and relatives and ushering them over to better vantages. The first bursts of fireworks met collective cries of delight that only grew in time with the spectacle’s crescendo. Each new colourful explosion added a celebratory exclamation point. 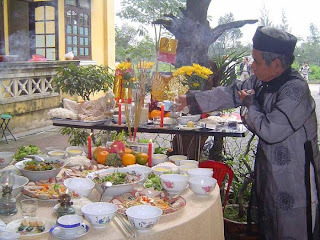 My friend explained his youngest daughter’s birth year made her the most suitable choice for người xông nhà, the first person to cross the household’s threshold in the new year. We entered behind her to a cavalcade of chúc mừng năm mớis, good lucks, and other well-wishes. Lì xì (A red envelope with lucky money inside) was distributed to the obvious excitement of its recipients and a platter of candied nuts, fruit, and seeds was opened to share. Relatives ducked in, contributing their own red envelopes and greetings. A bottle was opened for yet another round of small New Year’s toasts. Just being there to witness such genuine happiness felt like an honour. The night (now morning) wrapped up with heartfelt thanks and I cycled home along La Thành Road. Its edges were defined like an airport’s runway—the houses and businesses abutting both sides of the road were burning their own offerings to the returning Kitchen Gods. Small stalls sold willowy spears of sugarcane and massive red balloons emblazoned with golden New Year’s greetings and icons of luck and good health. Groups of friends laughed together over the year’s first bowls of phở (rice noodle) and bún (rice vermicelli noodle) and servings of xôi (sticky rice) or steaming sheets of bánh cuốn (steamed rice rolls). I balked at the thought of more food, but the atmosphere of optimism and good cheer remained infectious.